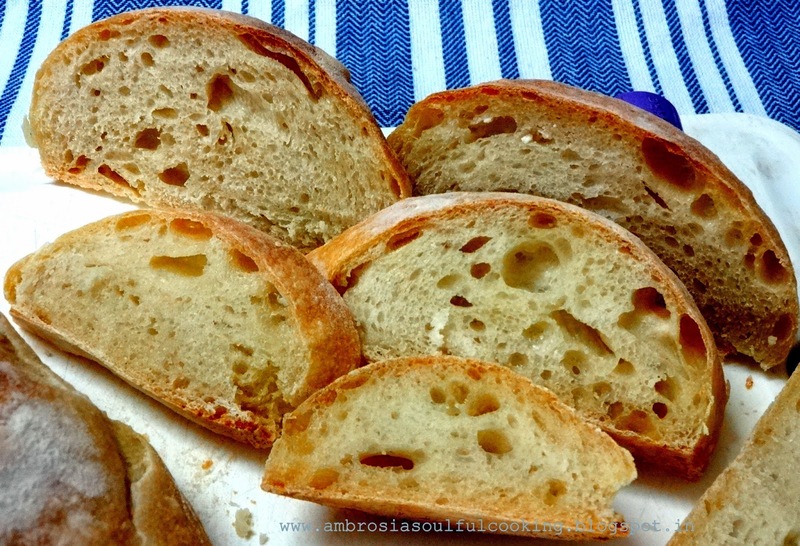 Ciabatta was always on my “must bake” list. I find it very interesting bread that has a rustic shape and chewy crust and soft crumb speckled with air holes. 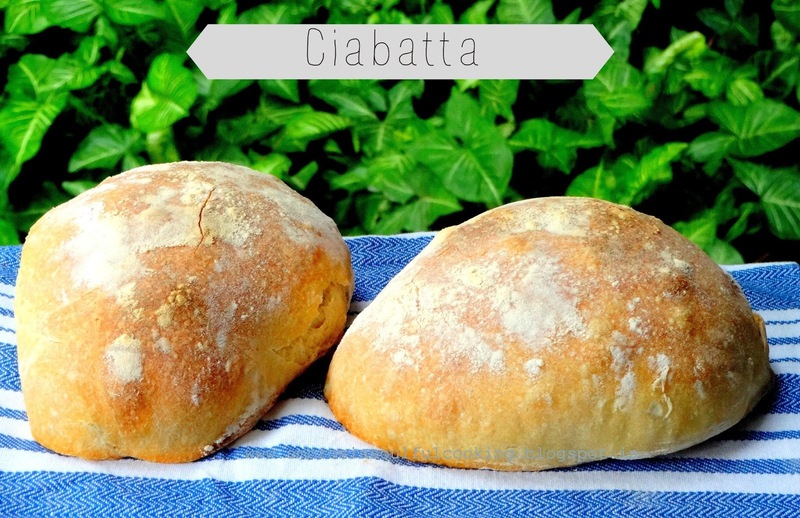 Cibatta is an Italian white bread made with wheat flour and yeast. Ciabatta ( chi-bat-uh) means slipper shaped. Baker’s lore says that the loaves are meant to resemble old house slippers. The dough is extremely wet and difficult to shape into loaves. The dough is given a series of folds during its long rising time. The recipe is not complicated at all. However, it does require a bit of planning since the biga needs to be made the night before you plan to bake it. This step is very important as it gives ciabatta its extra crispy crust and chewy crumb. It is a perfect bread for dunking into soup, or mopping up the last bit of gravy from your plate or simply slathering with butter and enjoying with a cup of tea. Having made one, I wonder what took me so long. Stir all the ingredients in a deep bowl. Cover and let rest at room temperature overnight. By next day, the biga will look soupy with many bubbles dotting the surface. Add all the ingredients of dough to biga and mix vigorously. I used a ladle and my hands to bring dough together, for 6 to 8 minutes. Add more flour if the dough is very soupy. Place the dough in a lightly floured bowl. Let it rise for 1 hour. Deflate it, turn around and let it rise for another hour. Turn the dough to a liberally floured counter. Flatten the dough and fold it over two three times. Cut it into two pieces, each about 4 inches x 10 inches. Transfer the loaves gently into a floured baking tray with 6 inches gap between them. Cover with a well-oiled plastic wrap and leave the loaves to rise for 1 ½ to 2 hours till vey puffy. Preheat the oven to 245 degrees C. Bake for 30 to 40 minutes or till puffy and well browned. Cool in the rack. Slice when completely cold.